That message, delivered first by a top aide to Mr. Romney on television and later by the campaign, contradicts top Republican Party officials and leaders in Congress, who have spent the last several days eagerly accusing the president of levying a new tax. 2010, Mr. Obama said the mandate should not be called a tax. They know perfectly well that Romney can’t agree on this. He implemented a mandate in Massachusetts, and he can never, ever concede that this was a tax. Obamacare already includes plenty of other taxes. Does one more really help their message much? Their whole crusade against the mandate has always been based specifically on the idea that it’s a liberty-destroying command from the government to buy something you don’t want. 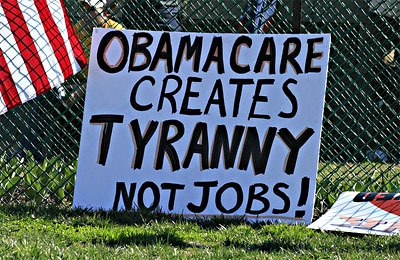 Even among the tea party set, a tax isn’t viewed as anywhere near as tyrannical as a mandate. What’s the point? Everyone who hates the mandate will keep on hating it regardless of whether it’s a tax or a penalty. Seriously, I’m befuddled by this. The whole tax angle seems like a loser to me. It muddies up the notion that the mandate is unconstitutional, it creates obvious friction with their presidential nominee, and it seems unlikely to change anyone’s mind or to gin up the base any more than it’s already ginned up. Why are they doing this? Is it just reflex? What am I missing here?